Ashley is PolishAddicted: Nail Mail!!! 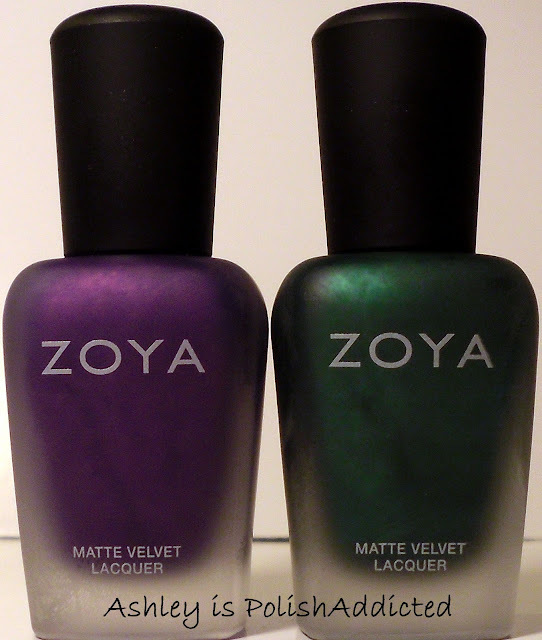 On Tuesday I received my two free Zoya's from their promo that I shared on my Facebook page. I know I am late to the bandwagon but I recently decided that I need all of the Zoya Velvet Mattes. Of course, after they are starting to discontinue them and they are now becoming hard to find. The only two they had on the site were Savita and Veruschka, they are gorgeous. Posh was my #1 lemming (and not on the site) but Savita and Veruschka were close behind. Check out the gorgeous purple and green mattes. And today I recieved a lovely package from my dear friend Cynthia. She is one of the sweetest people alive. She knew I was wanting Lacquistry Aqua Shredded and they were getting low on stock so she went ahead and ordered it for me. Wasn't that so sweet of her!? I sent her China Glaze Party Hearty as a thank you. :-) I received mine today and Cynthia added a bonus of an awesome glitter that is from the brand Nabi. I am unfamiliar with this brand but it's so pretty and I can't wait to try it! Thank you so much Cynthia!!!!! You are such a sweetie, thank you! Can't wait to see swatches of them all:) You do such a excellent job! Love the Zoya ones, they look gorgeous! Zoya Savita is probably my all time favourite Matte they make - if you like bright, go for Phoebe next!